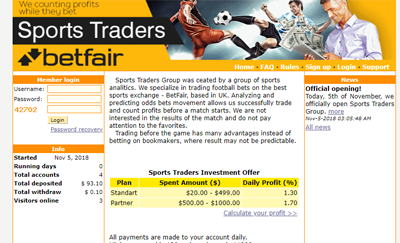 Sports Traders Group was ceated by a group of sports analitics. We specialize in trading football bets on the best sports exchange - BetFair, based in UK. Analyzing and predicting odds bets movement allows us successfully trade and count profits before a match starts. We are not interested in the results of the match and do not pay attention to the favorites. Trading before the game has many advantages instead of betting on bookmakers, where result may not be predictable. Memo: API Payment. Withdraw to CFMonitor from Sports Traders Group.. The amount of 0.78 USD has been deposited to your account. Accounts: U17230075->U10442942. Memo: API Payment. Withdraw to InvestorsCare from Sports Traders Group.. Date: 18:10 07.11.18. Batch: 235168613. The amount of 0.78 USD has been deposited to your account. Accounts: U17230075->U10442942. Memo: API Payment. Withdraw to InvestorsCare from Sports Traders Group.. Date: 15:14 08.11.18. Batch: 235268583.